The Audio Book has been taken from Librivox.org. There you can also download the whole audio book. Many thanks to Peter Yearsley who recorded this audio book. 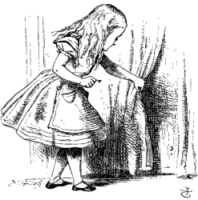 "Alice's Adventures in Wonderland" (commonly shortened to Alice in Wonderland) was published in 1865. It is a novel written by English author Lewis Carroll. Carroll's tale plays with logic, which gives the story lasting popularity among adults and children. It is considered to be one of the best examples of the so-called literary nonsense genre. Its narrative course and structure have been enormously influential, especially in the fantasy genre. The novel has inspired numerous film and television adaptations. There has even been a Disney movie. Moreover, there have been comic book adaptations as well as musical plays describing Alice's adventures in Wonderland. Note: In the English original, there are some references to English nursery rhymes as well as many English wordplays. These have been replaced by German poems and wordplays in the German translation. Also, at some points, the German translation differs in content. The tale tells of a girl named Alice who falls down a rabbit hole into a fantasy world called Wonderland. Wonderland is populated by peculiar creatures. The story starts with Alice being bored sitting on the riverbank with her sister. Suddenly she notices a talking, clothed White Rabbit with a pocket watch run past. She follows the rabbit down a rabbit hole when suddenly she falls a long way down to a curious hall with many locked doors of all sizes. There she finds a small key to a door too small for her to fit through. Through this little door she can see an attractive garden. Then she discovers a bottle labelled "Drink me". Listen to the audio book to find out what happens next and what peculiar creatures Alice will meet. Lewis Carroll (27 January 1832 – 14 January 1898) was an English author, mathematician, logician and photographer. His real name was Charles Lutwidge Dodgson, Lewis Carroll being his pseudonym. The author's most famous writings are "Alice's Adventures in Wonderland" and its sequel "Through the Looking-Glass", as well as the poems "The Hunting of the Snark" and "Jabberwocky". All these publications are examples of the genre of literary nonsense. Carroll is noted for his facility at word play, logic, and fantasy. There are societies dedicated to the enjoyment and promotion of his works in many parts of the world, including the United Kingdom, Japan, the United States, and New Zealand.